In the left column of the table below are the original lyrics to Do They Know It’s Christmas, a song to raise money for a charitable cause – to feed the victims of starvation and drought in East Africa. The words have been changed a little in the 2014 version, recorded to raise money to fight the Ebola Virus Disease in West Africa. When people with influence give their time and skill to helping others, I think it is ultimately a good thing. However, there will be fewer literal of examples of how the road to hell is paved with good intentions, almost like Stuart Jeffries points out. Where a kiss of love can kill you and there’s death in every tear. How can they know it’s Christmas time at all? Let them know it’s Christmas after at all? It was at a party on a dark December night’s evening in 2008 that I heard the Band Aid words for the very first time. I had known the song since I was a little boy and would excitedly sing its chorus, but I did not actually hear it until that party. Everyone was singing along, cup in hand and I joined in where I could (which really, to be honest, was the chorus at the end of the song) and as the other words hit me, I could not help squirming through some of the rest of it. “And there won’t be snow in Africa this Christmas time…” and I was like, duh-uh, it’s too hot to snow in Africa. Then I figured what they meant was that it would not be a frosty, festive Christmas, the sort of which Europe and America had. Well, uhm, okay, no Jack Frost but uhm, no festiveness across all of Africa? All? “The greatest gift they’ll get this year is life…” Hmmm. Okay, so as a Nigerian seeing the pictures of ‘starving Ethiopian children’ in the 80s, that might make some sense. But, again, the greatest gift? All of Africa? “Clanging chimes of doom”? A tad bit melodramatic, no? “Where nothing ever grows…”, – now, hold on just one second – “No rain or rivers flow…” In Africa? MY Africa? My country is divided by 2 rivers and we have a world famous delta. The vegetation in the southern part of the country is the Mangrove RAINforest. We still had groundnut pyramids in the 80s. So, just where on earth were Bob Geldof and his friends describing? The song has been re-recorded this year, to raise funds to support the fight against Ebola, with a little lyrical tweaking. Now, in WEST Africa, all of West Africa, there’s no peace and joy this Christmas and the only hope we’ll have is being alive, because a kiss of love can kill us and there’s death in every tear. 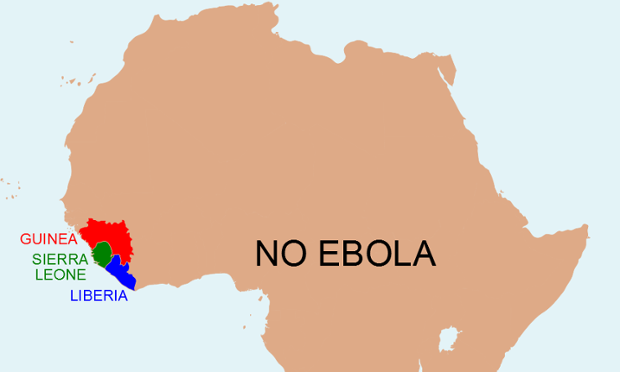 Great intentions again, Ebola being serious and deadly, but here’s the “Ebola Map” of Africa at the time of the song’s recording. What’s the harm in these well-intentioned lyrics, Sir Bob might ask. For one, it reinforces stigmas and stereotypes. The people who sing along to kisses and tears of death in “West Africa” won’t come here as tourists or businessmen. For another, the lyrics are just plain inaccurate. There’s also the question of how useful it is to set metaphors of a harsh Christmas for some against the homogeneity of the Euro-American celebrations. Bitter streams of tears have flown in different parts Africa at different times, but we’re not just a big crying, starving continent. There has been famine and starvation in some parts, but that’s scant justification for describing Africa as a place “where nothing ever grows”. There is now a growing backlash to the latest iteration of the song. It’s been described by Emeli Sande and Lily Allen as “patronizing” and “smug”. Sande actually feels some parts need re-writing or a whole new song is required. Better yet, Sir Bob and Friends could help promote this alternative song against Ebola. Every little helps. Just seen and shared your piece. Yes, the issues are somewhat complex, I guess. All giving is good and no help should be refused. But we won’t be hungry or ebola-infected forever and how we’re treated afterwards depends a whole lot on how we’re perceived now. @how we’re treated afterwards depends a whole lot on how we’re perceived now. I agree to an extent. I like to think that we can be powerful architects of a new narrative. For example, when I hear Rwanda, I think reconstruction, while genocide plays in the periphery of my mind. Naïve? Maybe. Hopeful? Yes.